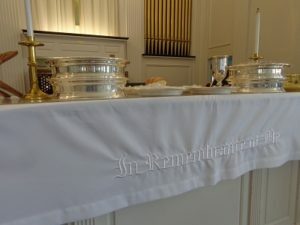 Just as we do not have an age requirement for baptism, we do not withhold the gifts of the communion table from anyone who wishes to receive them. We trust that God’s grace in the sacraments is effective at all ages and levels of comprehension. Following the radical inclusiveness of Jesus Christ, we welcome everyone to the table—young, old; gay, straight, or anywhere in between; cis- or transgendered; rich, poor, and anywhere in between; however educated or not; believers and doubters; sinners and saints. Truly, anyone wishing to participate in our celebration of communion is welcome to receive the gifts of Christ’s communion table—after all, we are not the hosts of the table, Christ Jesus is. Usually, we pass the bread and small cups (chalicules) of juice to the congregation seated in the pews. To include as many as possible, we serve gluten-free bread and red grape juice (chalicules of water are also provided for those who are allergic to grapes). At the Congregational Church of Hollis, we celebrate communion on the first Sunday of every month. Click HERE for an example of our typical liturgy for communion, although it’s subject to periodic changes with liturgical seasons.